As low as FREE for $25 Worth of Eco-Friendly Products for Home & Business! 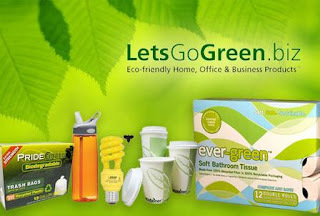 Today at GoezDeals, you can get $25 worth of eco-friendly products from LegsGoGreen.biz for as low as FREE?! The deal is on sale for $10, but all new shoppers get a $5 credit when they sign up, making it $5. BUT, I've heard that some people are getting $10 credit when they sign up. I don't know why some are getting the $10, but it would make this free if you do! LetsGoGreen sells a large variety of products like household cleaners and detergents with natural ingredients, 100% recycled paper products from tissues to toilet paper, and compostable and biodegradable plastic bags and wraps. NOTE: Shipping isn't included and costs around $5-$6, depending on where you live. Also, you will need to enter CC info even if it's free, but your card will not be charged.